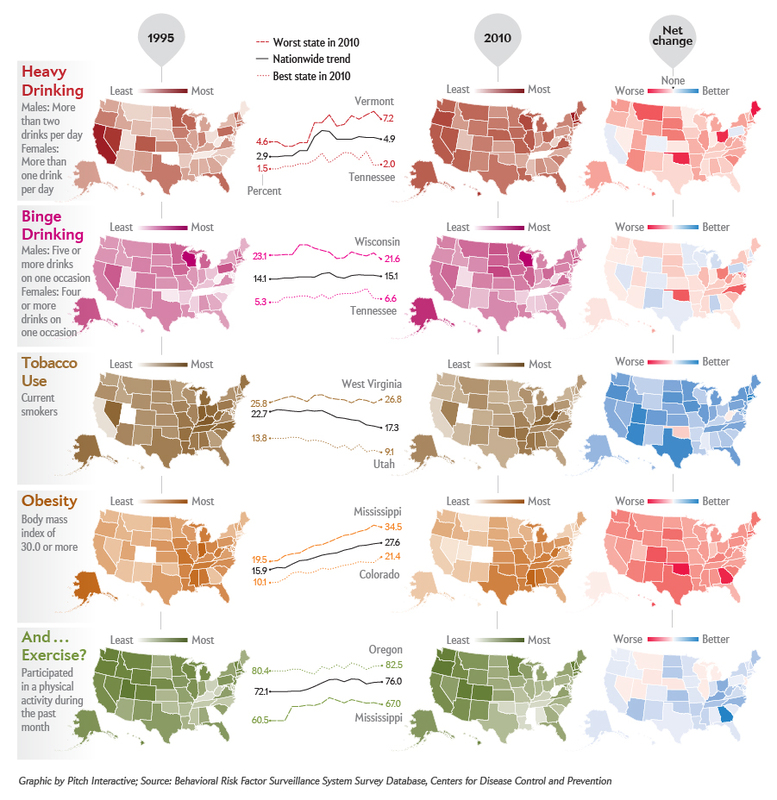 This week Scientific American published an interesting article about trends in health habits across the United States. The article includes both a large composite chart as well as a page with an interactive chart. Both are well done and a great example of using a visualization to help telling a story. I personally find the most useful part of the graphic to be the comparison column on the right with shades of color indicating degree of improvement (blue) or deterioration (red). 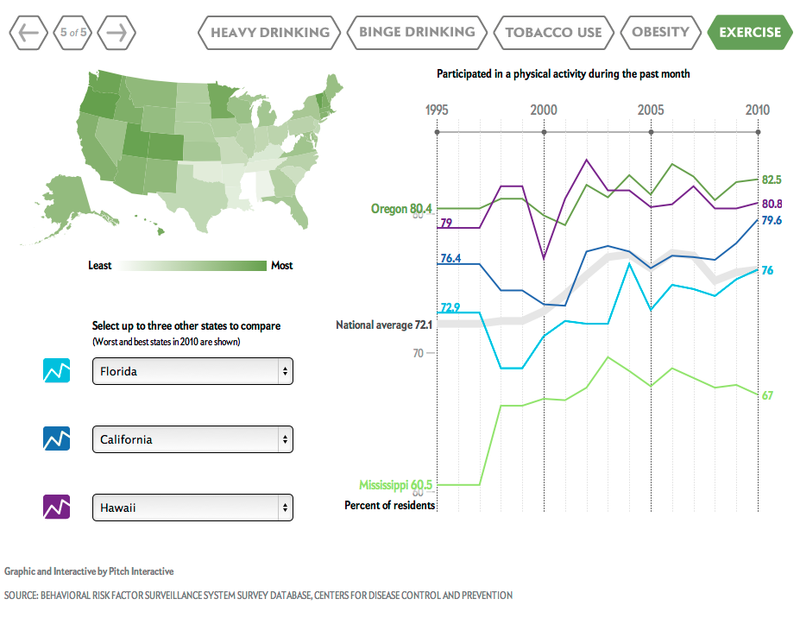 Americans are imbibing alcohol and overeating more yet are smoking less (black lines in center graphs). Some of the behaviors have patterns; others do not. Obesity is heaviest in the Southeast (2010 maps). Smoking is concentrated there as well. Excess drinking is high in the Northeast. Comparing 2010 and 1995 figures provides the greatest insight into trends (maps, far right). 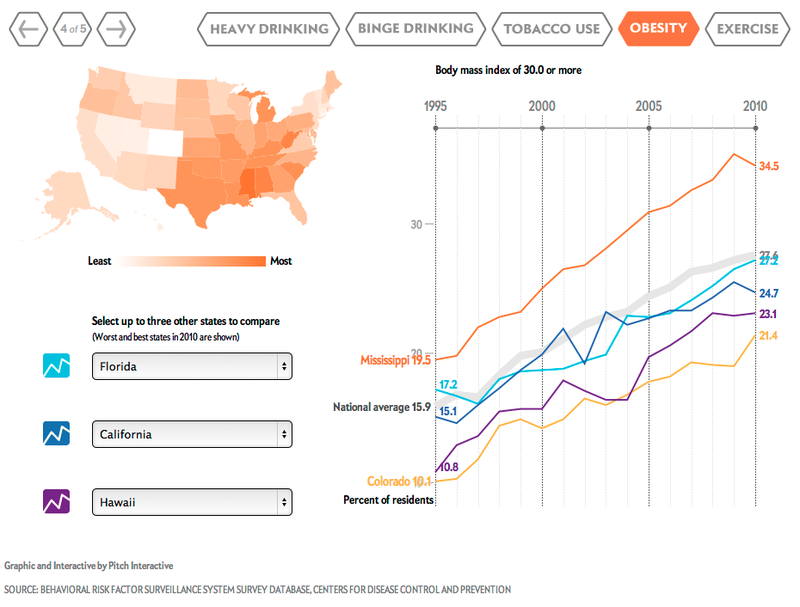 Heavy drinking has worsened in 47 states, and obesity has expanded in every state. Tobacco use has declined in all states except Oklahoma and West Virginia. The “good” habit, exercise, is up in many places—even in the Southeast, where it has lagged. A more detailed visual analysis is possible using the interactive version of these graphs on the related subpage Bad Health Habits are on the rise. Here one can compare up to three arbitrary states against top, median, and bottom performing states by health habit. 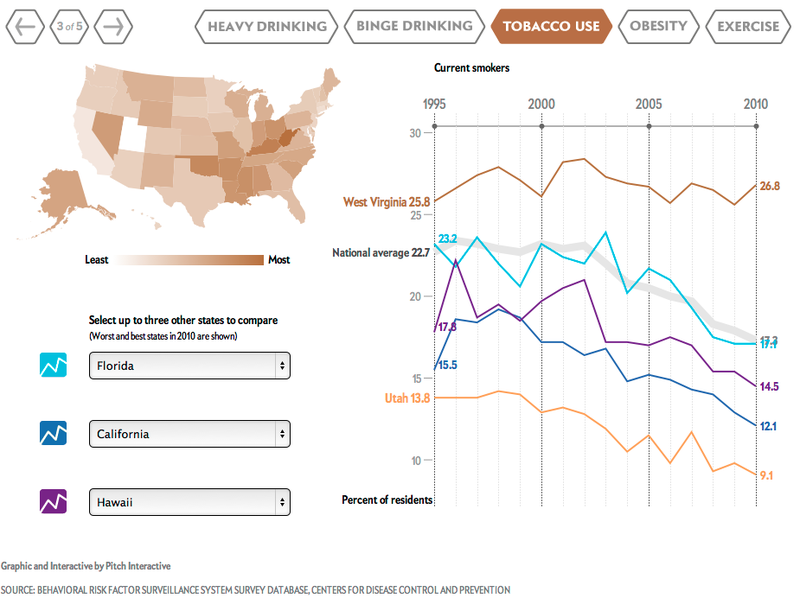 The following examples show tobacco use, exercise and obesity by state with line charts for the three arbitrarily selected states of Florida, California and Hawaii. Leading the exercise statistics are citizens in states offering attractive outdoor sports opportunities, like Oregon or Hawaii. Such correlation seems intuitive in both causal directions: People interested in exercise tend to move to those states with the most attractive outdoor sports. And people living in those states may end up exercising more due to the opportunity. When looking at the average trend line, exercise seems to have leveled off after a bump in the early 2000’s, whereas the decline in smoking over the last decade continues unabated. 15 years is half a generation. During that time, Americans have in almost every state smoked less, exercised more in many states, but obesity is sharply on the rise in every state! From a health and policy debate the latter seems to be the most alarming trend. Most people want the next generation to be better off than the previous one. This has to some extent been true with wealth, at least until the great recession of 2008. But these data show that at population levels, more wealth is not necessarily more health.